Fans were expecting an unbelievable bout when Latino Heat and RVD faced off for the Intercontinental Title in May 2002. They would not be disappointed, as the two masters of the Frog Splash waged war in a Ladder Match, with the title hanging high above the ring. The match didn’t stay in the ring for long, as the two combatants tumbled to the outside, brawling on the arena floor. Guerrero was sent head-first into the steel ring post before forcing RVD to take a faceful of ladder. The high-flyers then took to the skies, crashing down on each other before scaling up the ladder, attempting to grab the title. 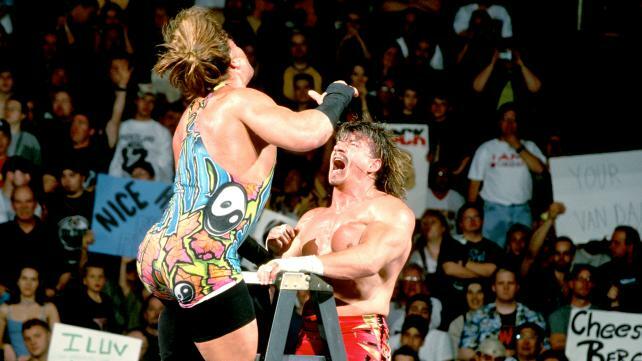 Then, as Van Dam looked to be going for his trademark Five-Star Frog Splash from atop the ladder, the steel apparatus gave out from under him, sending RVD crashing to the canvas. He was able to recover, incapacitating Latino Heat long enough to climb the ladder and reclaim the Intercontinental Title.